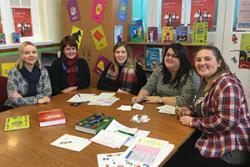 left to right: Tutor Nia Williams (Bangor University) with Cath Newbrook (Ysgol Min y Ddol), Hanna Owen (Ysgol Llanarmon DC), Emma Thomas (Ysgol Croes Atti Glannau Dyfrdwy), Ffion Edwards (Ysgol Croes Atti). The assistants, all from Welsh-medium primary schools in the counties of Flint and Wrexham, use Welsh on a daily basis, supporting teachers and pupils alike. The hands-on higher-level course, taught by tutors from Bangor University at the site of the Ysgol Croes Atti Glannau Dyfrdwy, Shotton, aims to build on their existing skills and boost their confidence to use the language at work. This is latest course in the Welsh Government’s Welsh-language Sabbatical Scheme, which aims to prepare teachers, lecturers and classroom assistants to use Welsh more confidently in a professional context. The Scheme celebrates its tenth anniversary this year. Introducing the higher-level course for classroom assistants is a fitting way to celebrate, according to Lead Tutor Eleri Hughes. “In Spring 2006, Canolfan Bedwyr lead the work of developing the very first sabbatical scheme courses for teachers and lecturers. They were pilot courses which later became officially accredited university modules taught at Bangor University, Cardiff University and Trinity College St David’s, under our direction. “Since then, the Scheme itself has developed and includes courses at entry and foundation levels as well as the original higher-level course. What sets all these courses apart is the fact that they’re totally work-focused. Everything that the classroom assistants do on the course is something that they would normally do in school. “The course will enable the classroom assistants to further develop their knowledge and understanding of the Welsh language and will increase their confidence in using the language freely in the classroom. The classroom assistants course runs for a total of 18 days over a period of 11 weeks. As with all the Sabbatical Scheme courses, it is fully funded by the Welsh Government, who also pay travel expenses to the individuals and cover costs to their schools. The next Sabbatical Scheme course to be held in north Wales will be the higher-level short course for teachers and FE lecturers which begins in April. The closing date for this course is 29 January. Further details are available by contacting Canolfan Bedwyr on 01248 383293 or cynllunsabothol@bangor.ac.uk.